It has been generally accepted that it is difficult to refill Canon carts more than 5-10 times because they stop providing a reliable ink supply when they have been refilled too many times. There are several theories to explain why these cart carts “clog”, but the explanation that seems to make the most sense is that the sponge and filter get clogged with an ink residue, or “glop” (post #9 in this link) that blocks the ink flow. Several methods have been given to help break down this buildup. These techniques help, but they do not restore a cart to its “like new” condition where it can again be refilled a number of times without a problem. It is the purpose of this write-up to detail a method that promises to do this and therefore to greatly extend the useful refill life of a cart. As has been noted by others (post #3 in this link), warm water can be very effective in cleaning this water based ink residue from carts. A simple, inexpensive test rig was constructed to allow hot tap water to reverse flush a cart to remove this residue with very little effort. The first step is to connect a garden hose to a faucet that has hot water. The following photos show the parts that were purchased at a local home supply store to do this in my kitchen sink. 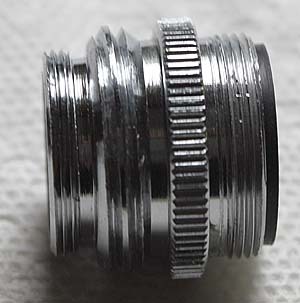 The first 2 photos show the parts required to adapt the garden hose to the faucet, and the third photo shows the assembled rig. The final hose is a 3/8” ID clear vinyl tubing (a clamp was later added to the brass fitting to keep the tubing in place when the hot water softened the tubing), and it fits snugly around the exit port of the cart as shown in the 4th photo. To clean a cart, remove the refill screw (or plug, or whatever you use) and make sure that the vent port is also open. Turn on the hot water at a low flow rate and watch the ink flush out of the cart. This clip shows the process on an OEM cart in real time. This cart has an extra vent hole in the sponge chamber that was put in a few months ago to test directly injecting ink into the sponge, and the high flow rate of water through the sponge chamber is part of the reason why this cart purged the sponge so quickly. In general, it takes 30-60 seconds to completely clean a cart with this technique. Also note that the sponges in the OEM carts do not seem to be colored by the ink, and these sponges give up their color much better than other carts (see below). This clip shows what happens if too much water is pushed into the cart – the pressure builds up and the hose just blows off the cart. Just reduce the water flow and repeat the process if this happens. After the clear tubing is used a number of times it doesn’t grip the carts as snugly as when it was new, so just cut off ¼” from the tubing to get a “fresh” end (the end must be cut “square” to work properly). The hot water did a very good job of cleaning the “glop” out of the hole between the two ink chambers and in the vertical grooves in the sponge chamber, and I did not see any glop during the cleaning process. However, by tapping each cleaned cart on the bottom rear corner, I was able to break some foreign material free on a few carts, as shown on these photos. The cart on the second photo had what looked and felt like a very small piece of rubber – maybe from sealing the fill hole when the cart was initially filled. 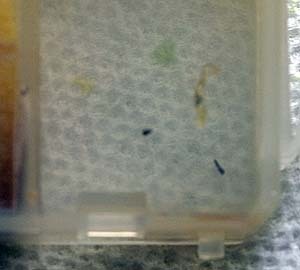 The third photo shows a cart that had a buildup of solid glop in the bottom corner of the ink chamber. Once the glop in these carts was broken free, another short hot water purge easily pushed it out of the refill hole (which is how I was able to feel the material in the second photo). 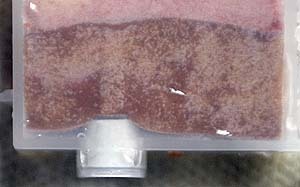 This cleaning technique generates enough pressure across the filter and sponge that it can shift the sponge inside its chamber, and this will cause the cart to malfunction if the sponge is not moved back into its proper position before refilling. For example, on some carts I was not able to blow the water out of the ink chamber by blowing into the refill hole. The sponge was apparently pushed tightly into the ink transfer hole as shown in the first photo below (looking at the bottom of the cart). The second photo shows the same area after the cart was tapped on its front face to move the sponge away from the rear. The movement of the sponge is subtle, but it was enough to allow the water to be freely blown out of the ink chamber. It can also be seen that the sponge lost its tight contact with the bottom of the cart when it was tapped on the front (addressed below). In addition to moving toward the ink chamber, most of the sponges were pushed up as shown on the first photo below. This shows that there is now a direct ink passage from the ink chamber to the top of the filter (a very bad thing) and that the sponge is completely free of the vertical grooves in the back of the sponge chamber (a good thing) – see post #72 in this link. Tapping the cart on its bottom front and bottom rear (but NEVER on the exit port) dropped the sponge back into position as shown in the second photo. In all cases, water could easily be blown out of the ink chamber after the sponges were properly repositioned. It is important to refill the ink chamber with a syringe to test this behavior before proceeding. In fact, the entire procedure of getting the sponge into the correct position is critical to the success of the refilled carts. Now that the carts are clean, the water must be removed before they are refilled or the ink will be diluted, giving poor color, a low viscosity and a high surface tension. Using duct tape and various parts of tubing and hose, I fitted a piece of the same 3/8” clear tubing to a “wet-or-dry” shop vacuum, and used the vacuum to pull most of the water out of the cart. It took between 30 and 60 seconds of vacuum for water to stop coming out. The carts were still far from “dry” at this point, even though most of the water had been removed. If you aren’t fussy about colors this condition may be good enough to refill, but I recommend placing the carts flat on a cookie sheet and setting them out in the sun to dry for a day or putting them in an oven at a low temperature (say 170 degrees F) for 8-10 hours to drive out most of the remaining moisture (do not plug any hole during this procedure). If you dry the carts in an oven, be sure to check the oven temperature with a meat or candy thermometer before inserting the carts. The carts might not be absolutely dry at this point, but the water content will now be so low that it won’t affect the ink colors or flow characteristics. The New InkGrabber carts (bottom row) were never refilled before, and the refill hole was just added for the cleaning procedure. Stains from the zinc plated screws can be seen on the three yellow carts that were previously refilled, but not on the other colors – is there something in the yellow ink that is particularly corrosive? None of these carts ever had a printing problem. The sponges in the Canon carts were not stained by the ink, but the sponges in the other 3 carts were all stained. Is this something that Canon does on purpose? 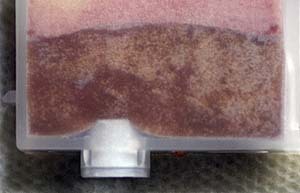 The sponges in the Old InkGrabber carts had the second least staining. 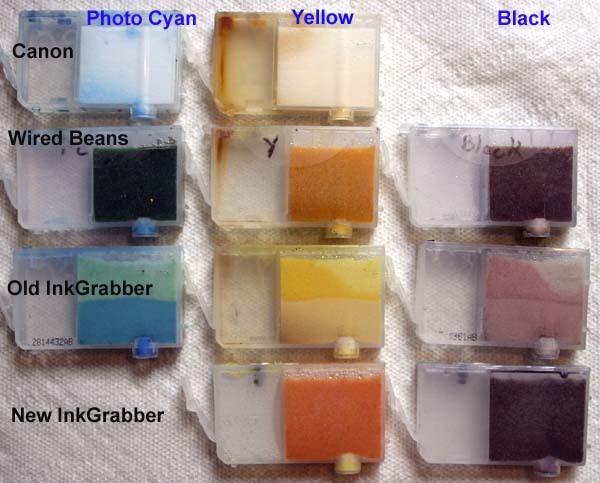 The sponges in the Wired Beans and New InkGrabber carts were about the same and had the worst staining. The Canon and Old InkGrabber carts have two piece sponges, while the Wired Beans and New InkGrabber carts have one piece sponges. After the carts cool, refilling is accomplished in the usual manner. One exception is that it will be necessary to force ink into the sponge using a technique similar to that shown in post #4 of this link. The sponge in the Wired Beans carts did not “need” to be force fed, but it did speed up the refill process. Actually, I found that simply pushing the needle down tightly into the refill hole gave a sufficient seal to allow ink to be forced into the sponge. For some fortuitous reason, the ink filled the bottom of the sponge and the filter without any special care or precautions. I had expected that it might be necessary to vacuum refill to “get the air out”, but was very pleasantly surprised to find that the ink pushed the air out of the sponges. 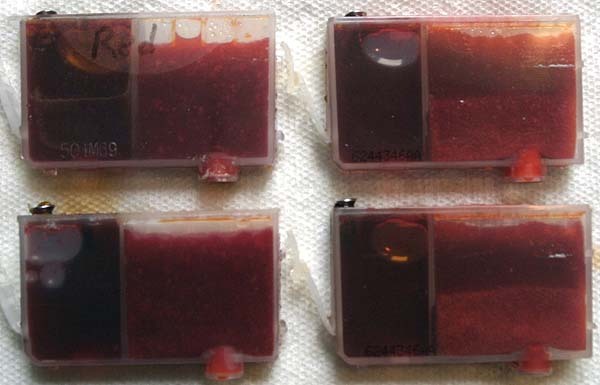 This is shown in this photo of 4 refilled red carts (laying flat). I have never had a problem caused by “overfilling”, so I completely filled both chambers. Before plugging the refill hole, remove the cart from its clip and make sure that ink drips from the exit port at a rate of at least one drop every 10 seconds (2-4 seconds is typical). 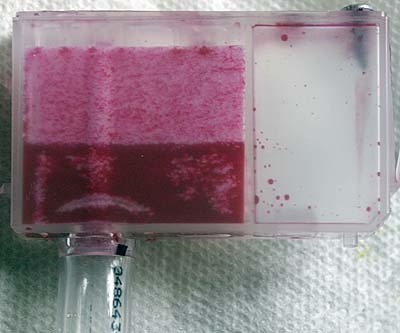 If the ink doesn’t drip and the level in the ink chamber doesn’t drop during this test, the cart won’t pull ink from the ink chamber when it is in the printer. If this happens, tapping the cart on its front edge may move the sponge enough to allow the ink to flow (ink will also come out of the refill hole when you do this, so be careful). Put the cart back in the clip, top off the ink (if required), then seal the refill hole. Remove the cart from its clip and let it drip in the sink for 30 seconds. Move the cart to an area of the sink that doesn’t have a water film on the surface (if there is a film of water where the cart sits, the water can “wick” ink from the cart and give a false indication of a leaking cart), and let each cart sit for about a minute. If more than a few drops of ink comes out (it will create a LOT of color), the cart will probably leak in the printer (the plug in the refill hole is probably leaking). Wash and then wipe the cart clean, wash out the clip and snap the cart into the clip for storage. This cleaning procedure should not be required every time that you refill – only when your carts begin to show signs of feeding problems. When your carts need to be cleaned, consider cleaning every cart and the print head at the same time. Since the carts will be out of the printer for some time, the head will “dry out”, so why not take this opportunity to clean it. Instead of using the 3/8” tubing used to clean the carts, use some ¼” tubing and press the tubing onto the rubber seal around each ink pickup to force water through the head – the hot water will help remove any ink residue from the ink passages and nozzles. Blow the water out using compressed/canned air just before putting the head back into the printer – it takes far longer for the printer to purge water from the print head than it does to fill empty channels. The carts that were refilled with this technique have performed very well to date. Even the notoriously problematic photo magenta has been not had any problems on any of the three PM carts that have been used to date. 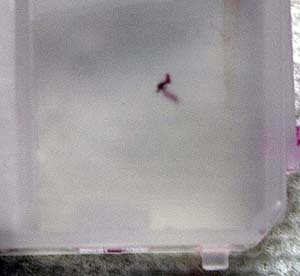 Every time that any cart has been pulled there has always been a small “puddle” on the ink pickup, indicating that ink is being delivered to the ink pickup without any problems. It is too soon to know how well these “cleaned carts” will refill – that remains to be tested over time. To make the refill tests more difficult, the carts are being run until the printer gives an “Ink Out” alarm and the printer refuses to print. This will decrease the number of cart changes and minimize the ink lost to cleaning (an extended cleaning cycle is run on every cart every time that the printer senses that even one empty cart has been replaced with a full cart – see this link for details of the ink usage during various cleaning cycles on a Canon i950). Also, when any cart is changed, every cart that is in a “Low Ink” status or appears that it will need to be changed soon will also be changed at the same time to minimize extra cleaning cycles – I have seen the situation where the cleaning cycle that is run after a cart is changed will empty a different cart and cause a double cleaning cycle when the second cart is replaced. If you use a power screwdriver (or cordless drill) to remove/install the screws from the refill holes, DO NOT use it to put the screws back in. It is too easy to strip the soft plastic and get a bad seal, so screw them back in by hand. 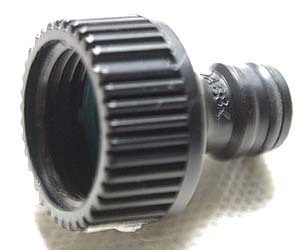 If you do strip the threads, use a glue gun to seal the hole and then just add another screw hole – there should be enough space to get at least 3 screw holes into the ink chamber. Refer to this thread for comments from others.